On September 22, 1943, a very strange and tragic murder took place in Massachusetts. What was considered by many to be a "mercy killing" in 1943, would likely be called a form of genocide today. A 46-year old Harvard-trained socialite lawyer was convicted of first degree murder for killing his six-month old son that had Down Syndrome. The baby was placed on a silver platter wearing a urine-soaked diaper, and electrocuted to death. The killer was later paroled after serving only six years in prison. John Noxon, Jr. was a wealthy attorney residing with his wife and infant son in Pittsfield, Massachusetts. Noxon was a corporate lawyer and had worked for a prominent bank. He also volunteered his legal services for the House of Mercy Hospital. Noxon was a World War I veteran that had been wounded in combat, and was gassed by the enemy. After returning to the States, he succumbed to polio, and had to wear heavy metal braces on his legs and use two wooden canes to walk. Noxon's hobby was building amateur radio equipment. On the evening of September 22, 1943, Noxon apparently cut the cord on a portable lamp, stripped 1" of insulation from the end of the wire, placed his 6-month old son on top of a metal plate, and electrocuted him to death by striking the live wire on his chest. Baby Lawrence was wearing a wet diaper that was greatly conductive. He sustained burns on his forearms and chest, and died of sudden cardiac arrest caused by electric shock. Noxon then took the baby's diaper, shirt, and wire from the lamp, and attempted to destroy them by burning them in a furnace. A sensational trial took place in March, 1944. The defense contended that Noxon had left the baby on the floor of the bookroom to obtain a tool in the adjacent room, and that the baby got entangled in wires on the floor and was accidentally electrocuted. The defense also asserted that the lamp wire was frayed or damaged from normal use, as opposed to having its insulation intentionally stripped. The defense countered by questioning expert witnesses that said the baby did not have the strength or acclivity to pick up the wire. The most dramatic moment in the trial was when a life-size model of the baby was presented by the prosecution. The defense counsel, former Massachusetts Governor Joseph Ely, objected to the model being used as it greatly shocked the jury. During the trial, a juror collapsed from the strain and could not function, and a mistrial was declared by the judge. A second trial took place in June, 1944. The prosecution produced greatly enlarged photos this time to display the victim's burns. The prosecutor questioned a banker acquaintance of the defendant, who testified that Noxon had talked with him about death by electrocution about three weeks before the murder. Defense attorney Ely brought up the fact that the police had removed furniture and other evidence from the Noxon home before informing the family or obtaining a warrant. On July 6 1944, John Noxon, Jr. was found guilty of murder in the first degree and sentenced to death (in the electric chair). The jury deliberated for only four hours, which included a one-hour break for lunch. The swift verdict was not expected, as the judge had given strict instructions to the jury about remaining impartial and to weigh each individual piece of evidence. 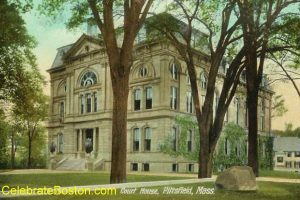 On June 20, 1945, an alternate juror law was passed in Massachusetts as a result of the first Noxon trial. In cases of capital crimes, 14 jurors would be selected from the jury pool from that time on, or 12 jurors plus 2 alternates. Also, on May 10, 1946, the Massachusetts Supreme Court upheld Noxon's guilty verdict and stated that there was no "bias, prejudice, or animosity" during his second trial. A strange turn of events occurred during the next few years. Governor Maurice Tobin was lobbied by former Governor Joseph Ely, the defense attorney, and others, and Noxon's death sentence was eventually commuted to life in prison on August 7, 1946. On September 4, 1947, a 40-page pardon petition was was filed by Governor Ely for Noxon. In December, 1948, the new Governor, Robert Bradford, stated to the press that he had discerned Noxon's "sincerity" by not accepting a plea deal originally and to fight a first-degree capital murder charge. In reality, Noxon was never offered a plea deal. Governor Bradford recommended leniency for John Noxon, and on January 4, 1949, Noxon was paroled from his life sentence and released from jail. Of special note, Governor Bradford was a former law partner with Governor Ely, the attorney for the defendant. Using conjecture, one has to presume that euthanasia was in the public's mind in 1949. A convicted first-degree murderer had his death sentence commuted, and within two years was released from prison. His baby was described as having a "defect or lesion of the brain," "being mentally defective," and afflicted with "mongolism." A "mercy killing" was defined at that time as "a parent or other relative putting an end to the sufferings of an incurably stricken person." One has to infer that a "mercy killing" of a person with birth defects was morally abhorrent in 1943, but morally acceptable in 1949. Today, we of course know that people with disabilities can achieve the unachievable, and can be an inspiration to everyone.